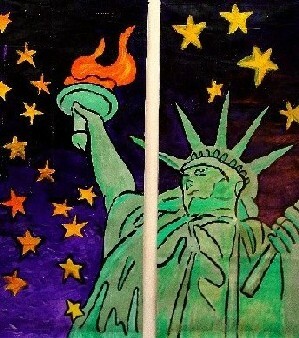 rePublic Art is a non-profit arts organization begun by Great Murals of New Haven, CT and Ann Arbor, MI. 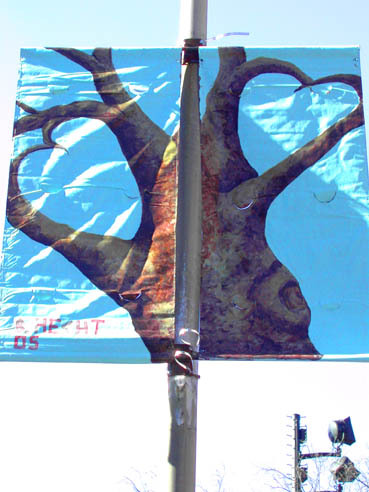 Great Mural’s founder JoAnn Moran envisioned a series of different streetlight banner exhibitions; each creating “Art in the Air” by using a banner on either side of a street-light post, producing public art much larger than the “single” banners some cities use. 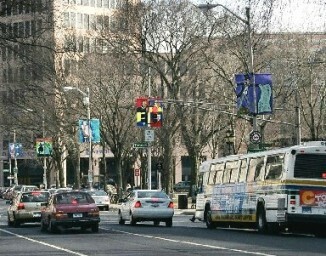 Banners in rePublic Art’s collection are 6 ft. wide and 6-10 ft. tall, and have a major visual impact on downtown streets – one that has thrilled every city involved. 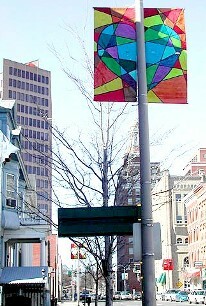 In addition, Ms. Moran’s expectation, after years of working with school children, was that by creating teams of professional artists and students, beautiful banners cities would be proud to hang could be created –and at a cost so low that they could have enough banners for new exhibits each season or for special community events. The final vision was that rePublic Art’s banners would reflect themes that involve students and artists in their city, and show that art can not only help create a sense of “community” but also a sense of responsibility to helping maintain and improve our heritage. 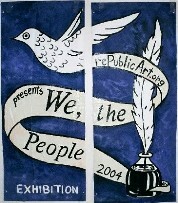 The first theme was We the People, where students in New Haven painted banners depicting the words from America the Beautiful. It was so popular with the students and the city that they then began working on banners illustrating the Preamble to the US Constitution, a much more difficult project in which students also had to learn about the Preamble to understand its meaning. and businesses in each city. Now there are several new themes. Elementary students in Lincoln Park, MI made a set of banners about Ecorse Creek, the river that surround their town, and they’ve become part of an Adopt-a- River project. Eaton Rapids and Ann Arbor, MI have combined the River theme with seasonal environmental themes. In the newest project, New Haven (where it all started) began a city-wide campaign called Heart of the City. 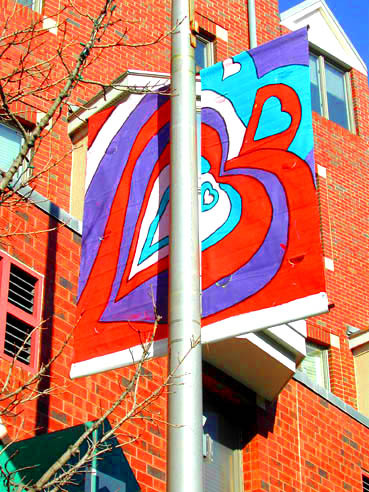 Businesses sponsored banners that used the shape of a heart to reflect something about the city that citizens could be “passionate” about – and the exhibit was mounted just before Valentine’s Day. 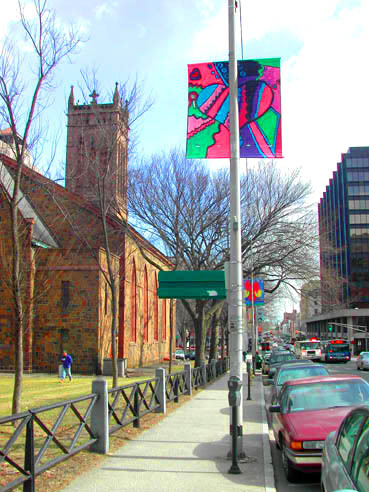 Banners are grouped into professional artists and several student age ranges and anyone can log on HeartOfNewHaven.com to vote for their favorite. The area’s leading art reviewers are also adjudicating. Both juried and people’s vote prizes will be given. It’s been a huge success. In Michigan, several cities and the State are working on 3 new themes; Celebrate Great Lakes, Cool Cities and the Heart of the Great Lakes (for heart-shaped Lake St. Clair). 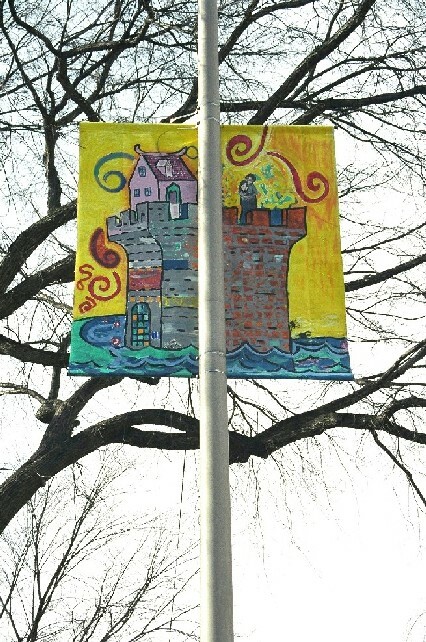 Elementary students from two states made these banners that have hung in North Carolina, Michigan, Connecticut, New Hampshire and Massachusetts. Each has another line of the song on the other side, so that when hung in order, cars passing through town see images of the first verse of America the Beautiful in order. There are now two sets that can go to any city joining the program. These were made by students in New Haven and North Carolina and have toured the East Coast. Again each banner has another line on the other side so that, hung in order, the banners depict the Preamble. rePublic Art sends the banners and helps buy the hardware for hanging, if necessary. The banners are hung so students see what they’ll be creating, and sponsors can be signed up to help pay for the workshops. 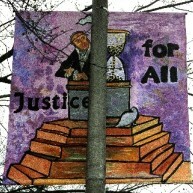 Each of these banners was sponsored by a business that helped create the theme. The first one was an art gallery, the second a fruit stand, and the third is an urban forestry project. 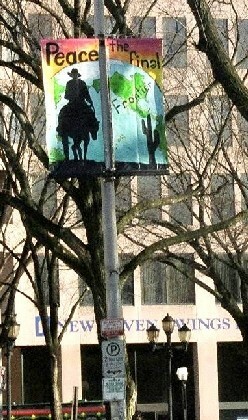 Over 200 Banners were designed and hung in February. ALL Banners produced by rePublic Art are made of RECYCLED BILLBOARD VINYL –besides the vibrant colors, it is made to last a long time. 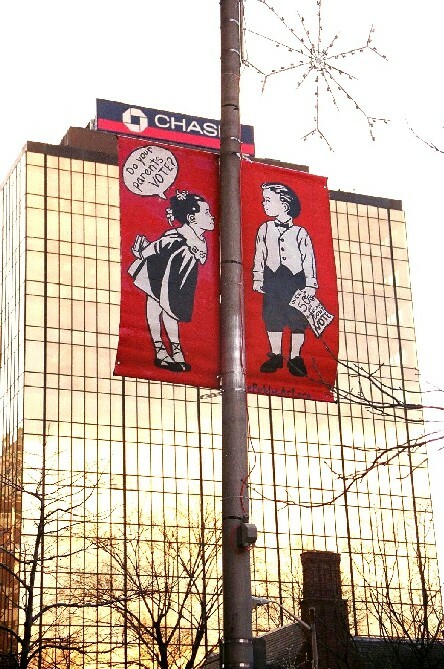 Some banners in Michigan have hung through 2 hard winters, with NO wear or tear. 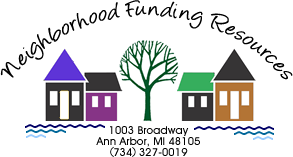 In 2005/6 rePublic Art is seeking sponsors for a statewide series of campaigns in Michigan that will later be duplicated throughout the Great Lakes area. Celebrate Great Lakes (CGL): In the summer of 2005, several Michigan agencies, cities and sponsors are producing a traveling show on the History of the Great Lakes that was a major tourist attraction when it was first mounted in 1989. It’s performed outdoors, and will generally perform in waterfront parks in Michigan Port Cities. Most larger cities will host two or three performances on a weekend, and smaller cities only a single show. Each performance will have 2-4,000 people in attendance. It’s expected that there will be 3 or 4 shows per weekend for 14 weekends from June 30th to Sept 11th. The total will be about 50 performances, before 150,000 people, in 20 Cities. 1) Workshops in Ann Arbor and Eaton Rapids will create 50 Great Lakes banners. 2) 10 Banners are sent to each performance site to hang in the area of the performances. 3) In most cases, rePublic Art will also help the cities purchase the hanging hardware. 4) The banners will be mounted for about two weeks before the show, motivating the citizens of the town and any visitors over that time to come to the event. 5) The CGL event will have a tent where kids and families can work with professional artists from rePublic Art, to create more Great Lakes banners, before and after the show. 6) The goal is to create 10 Banners to replace the ones that were sent before the show. 7) The original Banners are forwarded to a site hosting the performance in about 3 weeks. 8) The workshop at the site is meant to be the promotion for a citywide banner campaign by rePublic Art that will begin several weeks after the show. The town will make its own banners reflecting the Great Lakes, Cool Cities, Heart or Waterkeeper themes. Cool Cities: Michigan’s current state goal is to create “Hot Jobs in Cool Cities,” 21st Century jobs for people who want to live in areas that stress “quality of life” and offer leisure time activities that motivate and excite people about their homes and their lives. Waterkeepers: There are 12 rivers or bays in the Great Lakes that have Waterkeeper programs. The Waterkeeper Alliance is a national program that connects Keeper groups around the country and Michigan’s Governor Granholm has committed to having a Keeper program on every major river in Michigan. This program raises funds and awareness for the Keeper program for the river, lake or bay on which a city is located. Heart of the Lakes: This is a Keeper program aimed at 27 Michigan and 12 Canadian cities, with a population of 3 Million people that border heart-shaped Lake St. Clair. Sometimes called the 6th Great Lake, it is much smaller that the other five, but it’s still the 6th largest lake in the country. This campaign will combine New Haven’s heart of the City program with the heart shaped Lake St. Clair theme. Each banner has a smaller 2 ft. tall, 3 ft. wide attachment for a sponsor’s name and logo. Each citywide project will have a website for public voting, with sponsor click-ons. Each city will have a street-wide banner with sponsors announcing the program. A set of banners can hang in a sponsor’s lobby, or outside with a recognition plaque. Each project attracts a great deal of local/regional media, which promotes key sponsors. To sponsor 1-16 complete light posts per year, it costs $800 per each banner; for more than 16 - $600 each; and $500/each, 30 or more. These can be 1 per chosen city, or more. 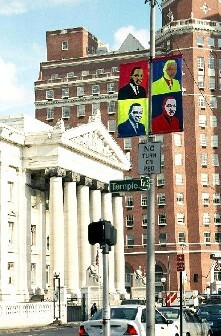 It is rePublic Art’s goal to have regional sponsors for 10 light posts as each city starts. From that point, local business sponsors will be able to support each city’s program.